Irina Rodnina won her first Olympic pairs title with Alexei Ulanov in Japan in 1972 with a performance that did more than break the mould, it smashed it to pieces. 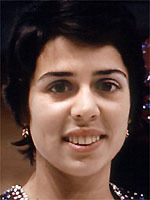 What happened at Sapporo proved to be a watershed in skating, the moment when the flowing, classical approach of the 1968 winners Lyudmila Belousova and Oleg Protopopov was swept away in a revolution fomented by Rodnina. The foundations of the Rodnina style had been laid back in 1969 at the European Championships in Garmisch-Partenkirchen in Germany. There, Belousova and Protopopov found themselves relegated to the equivalent of skating's dark ages after a performance by the Rodnina-Ulanov pair of such pace, audacity and technical and physical brilliance that it stunned spectators and judges alike. Rodnina maintained a vice-like grip on the pairs discipline of figure skating for over a decade. She remained untouchable in competition until 1978, picking up three Olympic titles in 1972, 1976 and 1980 as well as a staggering 10 world titles and 11 European crowns. Her record sits easily alongside that of Olympic greats like Gillis Grafstrom and Sonja Henie, themselves triple Olympic champions. It also matches the performances of both Henie and Ulrich Salchow, both of whom won ten world titles. Rodnina achieved her success with two partners, first Alexei Ulanov, then Alexander Zaitsev. After winning Olympic gold in 1972 with Ulanov, he announced that he was leaving her to team up with rival skater Lyudmila Smirnova, with whom he had also begun a romantic liaison. This hit Rodnina hard, but with the disappointment put behind her she began the search for a new partner. Her quest led her to Alexander Zaitsev, a young man from Leningrad three years her junior who, until then, had led a solo career. It was an inspired choice. The newly formed duo struck up one of the most successful partnerships in the history of figure skating, winning title after title at the European, world and Olympic level. The couple even married, although they separated seven years later. The tiny Rodnina, with her dazzling eyes, combined perfectly with Zaitsev, a tall, strong and elegant athlete. Rodnina's extraordinary charisma made them the perfect couple. The pair's talent blossomed at their first competition together, the 1973 European championships in Cologne, and in the free programme they were awarded 12 perfect scores of 6.0. They never looked back from there as they went on to become one of the greatest teams in figure skating history and can comfortably be described as all-time greats in the world of sport.